One of the major obstacles to hiking in Southern California is the lack of water sources. Not carrying enough water on a hike in the mountains can put you in a life threatening situation. There are a ton of stories of people who get thirsty and wander off trail in search of water and get themselves lost. I ran into trouble myself a few years back hiking up Mount Baldy when my girlfriend ran out of water halfway up the mountain. I have a bad habit of bringing the absolute minimum amount of water on a hike to save weight and I had underestimated the distance of the hike. We chanced it, assuming that we would have a clean water source somewhere along the way, only to find some dirty snow at the peak. We ended up hiking ten miles through the mountains in the middle of summer with empty bottles. It was not a situation I hope to repeat. I looked around the internet for a while for a viable way to purify water. I actually tested two different brands of water purification tablets. Although they would work in a pinch, they were both absolutely disgusting. The next thing I tried was a Katadyn water filter pump. It was expensive, added more weight to my pack than I would have liked and way too time consuming to set up and pump for it to be practical for a day hike. I randomly stumbled across an ad for the LifeStraw Go Water Bottle. I started to do a little reading about the product and the first ting I saw was that Forbes magazine gave them an award for One of the ‘Ten Things That Will Change The Way We Live’ . I was intrigued. After using the Go Water Bottle on the trail for 3 hikes, I was in love. Simply put, the LifeStraw Go Water Bottle is easily one of the best hiking accessories that I've ever used. It’s a BPA free water bottle with a water filter built in to the straw. You can literally scoop water from the stream into the bottle and drink it directly through the straw without waiting. The water has absolutely zero bad aftertaste as far as I can tell. The manufacturer claims it should filter 264 gallons of water before the filter needs to be replaced and should filter out 99.9999 percent of bacteria and 99.9 percent of parasites. However, they do recommend using a water purification tablet anywhere where human sewage might be present because it will not filter out viruses. The Lifestraw Go Water Bottle retails for $30, which is about 1/3 of what I spent on my Katadyn water filter. The Go Water Bottle also weighed less, 8 ounces vs 11 ounces and that’s not including the fact that you still need to carry a bottle when you’re using the Katadyn filter. You can attach the Go Water Bottle to your bag using the included carabiner, or just shove it into a side pocket like any other water bottle. I plan on ordering an extra one to keep in the car in case I ever break down and need fresh water. This would make a great addition to your emergency kit at home in case of some type of water emergency. As a resident of Southern California in the middle of a 4 year drought, it couldn't hurt to have one of these at home just in case. 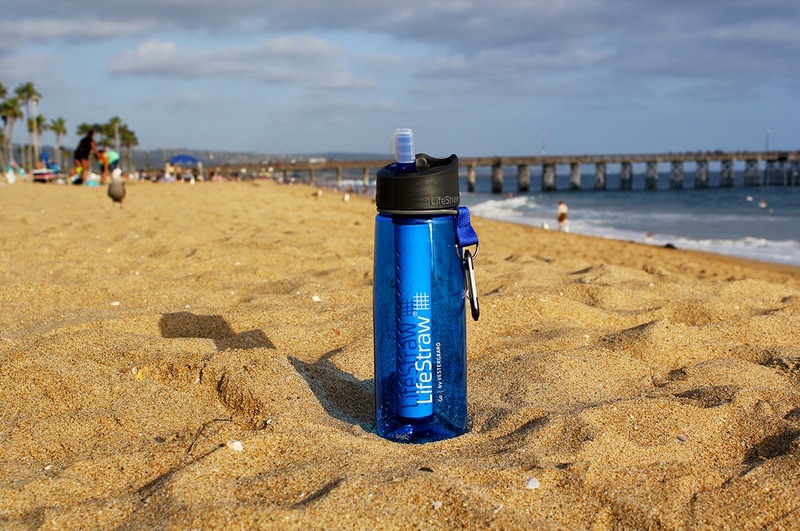 Another great thing about Lifestraw is that they do a ton of humanitarian work. They have an ongoing program called “Follow the Liters” where for every unit someone purchases, one school child in a developing community receives safe drinking water for an entire school year. They're making a measurable difference in the world providing safe drinking water to communities in desperate need.